It's that time again! A new set of releases from Sylvan Dell. You regulars know the drill and the facts about Sylvan Dell so I'll just jump right into discussing the books. Be sure to stay tuned for the awesome giveaway at the end of the post! The first thing that A Butterfly Called Hope has going for it is that it is illustrated with photographs. I really like that aspect of some of the newer Sylvan Dell titles. I photographs better explain the scientific information that they are trying to communicate to their young readers. If you, your kids and/or your grandkids are ever planning to have your own butterfly garden, this is a good title to have on hand to read along with your project. In this story a young girl finds a caterpillar in her mother's garden. She begins asking her mother questions about it and is informed that it will not hurt her and will, in fact, grow into a beautiful butterfly. They decide to keep the caterpillar, housing it through its transformation and the girl gets to see the process unfold before her eyes. Thanks to the photographs, we do as well. I really liked this title. It's one worth checking out for its simple, straight forward explanation and lovely photos. The Fort on Fourth Street: A Story About the Six Simple Machines is mathematically minding (which I am not). It reads off in the style and pattern of "This is the House that Jack Built" telling of the fort which a young boy and his Grandpa build together. The focus of the story is on the simple machines which are used to piece this fort together. It's a clever way to show the value and use of machines and tools in creating. I like that aspect a lot. Even if I'm not number-oriented (and avoid anything that smells like math in general). The purpose behind Anybody Home? , by Marianne Berkes, is to learn about the differences in animal homes. As is the case in all Sylvan Dell titles, at the back of the book you'll find additional information on the subject matter being highlighted. At the back of Anybody Home? we learn about the different names for various animal homes, such as caves, dens, dreys and hives. There is also information given about whether the animals within this story are diurnal or nocturnal. Another nice touch is a page of information about maps and grids (as the main character in this story was hunting for a new home and traveling about). Cleverly done! 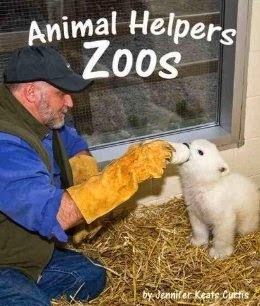 Animal Helpers is a series of books by Sylvan Dell and Animal Helpers - Zoos is the latest in the series. Again, we're back with photographs which I really think help explain what the people in this book are doing (i.e., taking care of zoo animals). This title is definitely one to mark down and read if you are planning a trip to the zoo anytime soon. Reading this will get your kids excited about their upcoming (or previous) experiences viewing giraffes, monkeys and rhinos. It also makes them to consider what it would be like if they were to grow up and work at the zoo. And the picture of the polar bear being fed with a gigantic bottle on the front cover? Seriously. Pure cuteness. I really don't know a child who doesn't dream of having a pet some day. This book encourages them to be asking for and thinking about pets so you may choose to stealthy avoid this title. 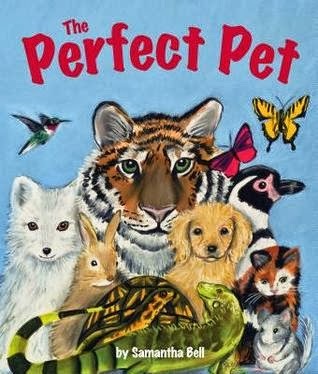 It takes a look at different animals and their needs as you decide on a pet that is just right for you. You see, a tiger would be hard to take for a walk, an octopus wouldn't fit into your water tank and a crocodile would be very hard to bathe in one's tub. Alas. 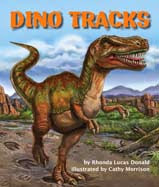 Lastly there is Dino Tracks , by Rhonda Lucas Donald. I have to tell you that when the package of books from Sylvan Dell arrived, this particular title was immediately snatched away from me by the Bookworms. It has disappeared into the confines of their bedroom and I'm not entirely sure where. I'm having to use Amazon's "look inside" option to tell you about this book as a result. Happily, the main text only uses the phrase "long ago" when speaking of when the dinosaurs roamed the earth. This satisfies the (literal 6-day) Creationist in me. (Again, if you are going to present the concept of evolution to children then I think its fair that you should argue the idea of creation with them as well. There is plenty of evidence. Assume the child can make up their own minds on such topics.) I can't say whether the information in the back of the book is evolutionary or not but I would expect so. The nice thing is that the story itself (told in rhyme) just talks about fossilized footprints which have been found on the earth and the story speculates as to what the dinosaurs who made such marks must have been like. I'm ok with a guess as long as you say up front that it is a guess! You can look inside any of these books by clicking on the Amazon links and checking out the "look inside" feature. That'll give you a better feel for any particular title. Also check out their website for more information on the books as well as activities to go along with each read. NOW! WOULD YOU LIKE TO WIN A SET OF ALL OF THE ABOVE TITLES!? Yup, that's right! Sylvan Dell has offered to give away this entire set of new Fall Releases to one of you. In order to be entered into the contest to win these, simply leave a comment below including a valid e-mail address. This contest is open to US Residents only and will be open through Friday, October 11th. THIS CONTEST IS NOW CLOSED. THE WINNER, as selected by random.org, is #16 - Traveler. Congrats! In the meantime, my thanks to Sylvan Dell for allowing us the opportunity to check these books out. I have received no additional compensation for this review and all opinions expressed are my own. Hello Carrie, I'm the illustrator of Dino Tracks and appreciate your review a lot. It's very interesting for me to get a creationist's view on a book about dinosaurs. I hope you find the book but I'm personally taking it as a compliment that your kiddos snatched it up. Thank you for the taking the time to review Sylvan Dell's fall list. 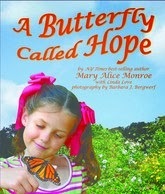 I added A Butterfly Called Hope to my list! I'm hoping to do the butterfly garden experiment with the boys sometime this/next year for "school". It sounds perfect to go with it! I saw your FB post. I saw this on fb and shared! And I would LOVE to own these! I saw this on FB!